Decorative mixes are still a big hit at holiday time. From soups to biscuits, the gift recipient can decide when they will use their gift. Just remember, already prepared food gifts usually have a time limit but gifts -in-a-jar, kits or hampers that contain the ingredients, tools and recipes can be made ahead of time and stored until needed. If the person loves soup, give them a gift basket filled with delicious dry soup mixes that you prepared yourself. Since it is winter, split peas, lentils and soup mixes are plentiful and cheap. Check your supermarket flyers to find out when they are on sale and stock up. Keep them in the freezer until you are ready to pack them into jars. This will ensure there are no live bugs (legumes are notorious for weevils) in the mix when you pack it. No soup gift basket would be complete without minestrone or chicken noodle. Include some of their favourites like potato soup, vegetable soup or bean soup. Biscuit and cookie recipes work well in the jar too. Properly measure out all of the dry ingredients in layers. Be sure that the jar is dry before adding anything so it doesn’t spoil and once it's filled store it in the freezer for at least 7 days. If you have the room it can stay in the freezer until you are ready to give it to the lucky recipient. Use the same guidelines as the bulleted list above for soups when creating your biscuit label. Condiments are lovely make-ahead gifts, and they lend themselves to being handmade very well. And as gifts, they are not only consumable, so no waste, but these types of gifts can be used all year round. They include items like flavoured vinegars, homemade seasoning mixes and dry rubs. If you like to grow herbs, then a holiday gift of dried herbs is perfect for the cook on your list. Also popular are bottled preserves, vegetables and fruits. After the bottling process they can keep for as long as you need in the vacuum-sealed jar. 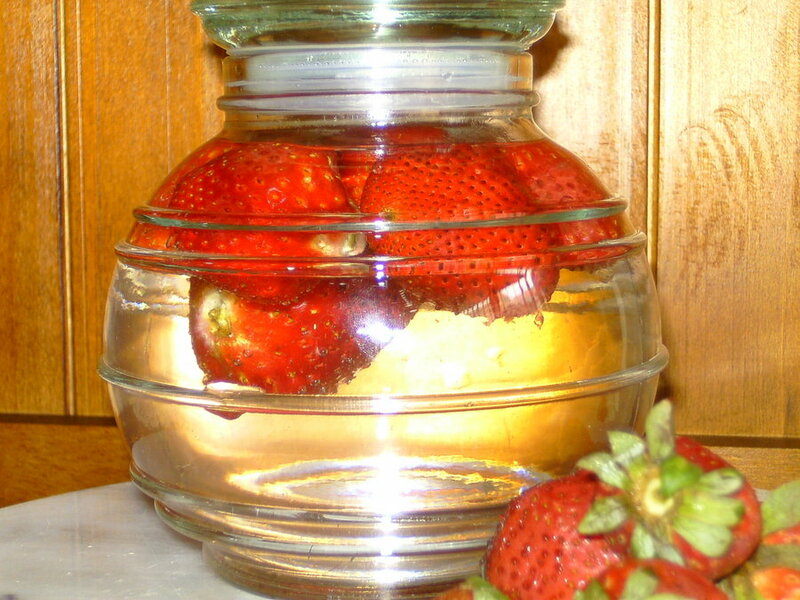 A lovely flavoured vinegar to give, that is easy to make and inexpensive, is strawberry vinegar. This delicately flavoured vinegar couldn't be any simpler to make, costs just a few cents and is truly a gourmet delight. You can use this vinegar in any recipe that calls for white vinegar, lemon or lime juice. Wash the strawberries. Pour the white vinegar into a clean, sterilized jar. Add the strawberries. Seal and store in a dark, cool cupboard to infuse for six weeks. If your vinegar develops a film over the top, don't worry. This is the vinegar mother, just skim it off. It is a natural part of the fermenting process. After six weeks, strain the vinegar into a small saucepan. Heat to boiling point and boil for five minutes. Strain through a clean cheesecloth into decorative, sterilized jars, seal and store in the fridge. What are you planning to give to others this Christmas? If it is a food gift, use the tips above for gift ideas and also ways to keep it safe to enjoy.